Microsoft Money Plus (or Money 2008) is the last version of Microsoft Money personal and small business finance software available to the market prior to its end-of-life sales discontinuation from June 30, 2009, with build version number of 17.0.150.1415. Four editions existed for Money Plus, namely Money Plus Home & Business, Money Plus Premium, Money Plus Deluxe and Money Plus Essentials. Microsoft Money is one of the best, if not the best, personal financial management software when it’s available in the market in term of user friendliness, online services, and ease of use, in addition to a Windows Mobile client for use when moving around. It’s easily better and easier to use than Intuit Quicken, which is one of the alternative suggested by Microsoft to replace Microsoft Money. The main difference between Money Plus and earlier version of Money such as Money 2007 is that Money Plus requires online activation in order to activate and unlock the full version product. With end of sales and discontinuation of Money line of products, the activation service will be shutdown too after January 31, 2011. It means that Money Plus which requires online activation cannot be reinstalled after the date. As such, Microsoft is releasing an offline version of Money Plus (2008), which named as Microsoft Money Plus Sunset, which has the build version number of 17.0.120.3817. Microsoft Money Plus Sunset which does not require activation is replacing the expired versions of Microsoft Money Essentials, Deluxe, Premium and Home and Business, and comes with full functionality and able to open (or convert) existing Money files from older versions of Money (e.g. Money 2006 and Money 2007) to access its transactional history (on current or future machines), excluding online services including online quotes, bill payment, statement downloads initiated by Money, data sync with MSN Money, etc, though Sunset versions can import QFX or QIF statement downloads. Money Plus Sunset also does not contain Online Help, which is replaced with a local Help file, and has not Assisted Support. 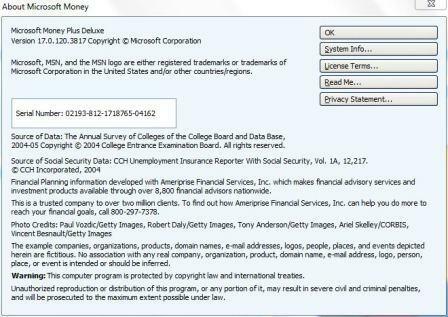 In a way, with the release of Money Plus Sunset, Microsoft is making Money Plus available free for everybody to download and install, regardless of whether the user is existing Money user or not. Money Plus Sunset allows unlimited installation and re-installation without the need for activation, not to mention crack or hack to bypass the activation, and does not require an existing installation of Money or any previous version of Money installed in order to install the “Sunset” versions.